We started our Garden of Eden Community Project in May 2006 to address the issues of merging community, ecology, cultural diversity and spirituality in our community. 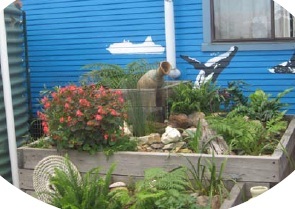 Our goal was to work with the community to create an eco-conscious and wonder-filled garden, and a lively community art and cultural centre to connect with Creator, Earth and all humanity. Eden (pop 4,000) does not have a community centre, community college or other place of learning or connecting. The nearest access would be either in Merimbula (25kms) or Bega (55kms). Most of the time, people have to leave Eden to access these services. We wanted to be able to offer a local place for everyone, regardless of spirituality, religion, background, age, etc where we could come together and learn from each other and create a richer community life and a greater respect for the Earth. The garden project was launched with all this in mind. One of its main functions is that it meets local needs and helps build community locally. The ‘Garden of Eden’ is a native garden, with low water demanding plants. The organic produce from the garden is sold in a monthly local produce market along with some other locally grown/made products. The garden is watered using a water tank and drip watering system. The church has also held workshops for community on climate change, water courses, discussions and film around peak oil, permaculture principles and the Transition Towns concept. Once a month we have a world movie night featuring films based around social justice and appreciation of other cultures. We have installed solar panels on our roof and our previous lay pastor Judith Dalton ran a series of exciting programs called the Wander and Wonder eco-ministry. Several of our church members have become vegetarian; many grow their own food; consume minimally; reduce, reuse and recycle and one has chosen not to own a car. The Garden of Eden Project has been an inspiration for other small towns in the Bega Valley Shire who have taken up the idea of building a community garden as a place for people to meet, share community and to grow local organic produce and thus reduce their food miles.